Here's a picture of my old Suzuki. 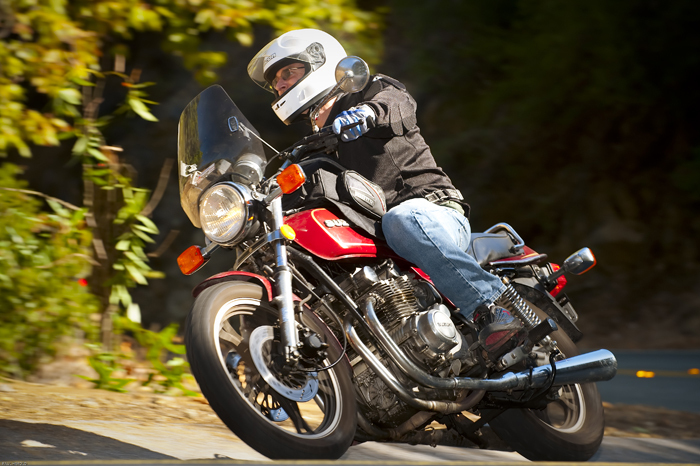 It's a 1982 Suzuki GS650G at the top of Stunt Road in the Santa Monica mountains in California. I was looking for an old Japanese standard from the 70's, preferably a Suzuki GS1000E chain-drive model, which I owned a long time ago and really liked. 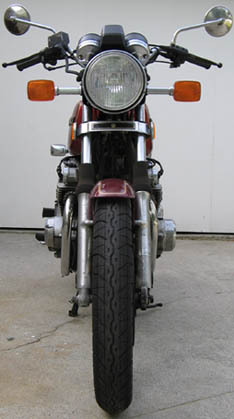 Then I saw a GS650G for sale locally, in good shape with less than 10,000 miles on it. I wasn't interested until I started doing some research and found that it is a really good bike. You might think a 650 of this era would be a stripped-down bike with few features, but this thing has everything. It came with shaft drive, adjustable suspension (Rebound and preload in the back, and air valves on the front), double disk brakes on the front, a single disk on the back, a really cool lighted gear indicator on the dashboard, and electronic ignition, and it was quicker through the quarter mile than the BMW and Moto-Guzzi shaft-drive bikes of the era. Also, it weighs 499 pounds with a full tank of gas, and I was looking to buy a lighter bike than I've had in the past. The factory claimed that it makes 72 horsepower. Compared to my Moto-Guzzi V1000 Convert, riding the Suzuki feels like cheating. When I was doing research about the Suzuki GS650G on the internet, I came across the personal website of Ron Hurd from Colorado. He has a tremendous collection of classic bikes. Among them, he has 2 Suzuki GS650Gs, and he says they are his favorite bikes. After reading that, I decided to take a test drive on the one for sale in my neighborhood. 1) Don't get emotionally attached to the vehicle before you buy it, and don't let the buyer know you like it. 2) Don't buy a vehicle you've never seen in daylight. 3) Don't buy a vehicle that hasn't been registered for years unless you know exactly what it will cost to register it. In California I had to pay for 5 years of back registration ($255!) to get it on the road. 4) Don't buy a vehicle that has been sitting for years unless you are prepared to take the engine apart and replace gaskets. My Suzuki worked fine for about a week, then started smoking when I start it. It needs new valve guide seals. It only smokes for a minute or two, then runs clean, so I could ride it like this and be fine. The big trail of smoke is just a little embarrassing when I leave my house or leave work. Sometimes it doesn't smoke at all. What's it like to ride a Suzuki GS650G ? Here's a video, or read below for an in-depth description. Either way, I love this motorbike. This motorcycle is about motorcycling in its purest form. There's no ego here. It's not the fastest, prettiest, sexiest bike. In fact, every time I take it to the Rock Store, it's the least valuable bike there. People don't notice it. Women don't swoon when I ride by. I even took a woman for a ride on it on a date once, and she never returned my calls after that. This bike is purely about practical functional comfortable fun riding, and it is truly one of the best all-around motorcycles ever made, and it works so well that I don't even have to think about what the bike is doing. It just works, and my body and mind are in a state of pure action. Very Zen.. That being said, if I want to attract the ladies, I ride my Royal Enfield Bullet, which really draws a crowd. Here's a shot of me riding Mulholland on the Suzuki GS650G motorcycle. Seating position is upright with nice pulled-back handlebars. You don't have to be a yoga master to be comfortable all day on this bike. It's a long little bike, too, with a 56.7 inch wheelbase, 19-inch front wheel, and 16-inch rear. This makes it very stable at high speeds. I really like it on a twisty road. With the adjustable suspension, I can set it on the softest setting (1) for the ride up to Mulholland, then crank it up to 4 out of 4 when I get to the twisty bits. I don't have to stop the engine or even get off of the bike to do this. I just pull over, and reach back and turn the shock collars to increase damping. This is the part where I'm supposed to say that I can surprise people riding sportbikes on twisty roads and leave them behind. I've done that to less experienced riders on faster bikes, but speed follows the rider more than the machine, and I've been passed often by sportbikes ridden by experts. I like to ride smoothly and carry speed through the corners, rather than accellerating hard on the straights, braking hard, then building up speed through the corner. I save a lot of money on brake pads this way, and I have as much fun as the faster guys. Maybe more. And at the end of the day I feel great, whereas the sportbikers have sore backs, necks and wrists. Set up like this it handles nicely and is a lot of fun. It needs some revs to move quickly, so for maximum speed I keep it over 6,000 RPM and use 2nd and 3rd gear. Redline is at 9,500. It's got good midrange for a 650, so it works ok at lower RPMs as well. Look at the front-view picture of the bike to see now narrow it is. This makes it feel even smaller than it is. I found an old magazine article from 1982 which said it handled better than some sportbikes at Willow springs, and they clocked it at 12.91 seconds in the quarter mile. Top speed is 125 MPH. For reference, the Suzuki GS850G, which is 100 pounds heavier, runs the quarter mile in exactly the same time. The GS650G had better overall performance than the BMW and Moto-Guzzi shaft-drive bikes of the day, and it was much cheaper. Lots of people used them for touring. The engine is a little buzzy through the handlebars above 5,000 RPM, and it can be uncomfortable at speeds over 75 MPH. I bought a bar snake to put in the handlebar, but haven't installed it yet, so I don't know if it will help. I think it will, as the buzz isn't that bad. Thick squishy touring grips would probably solve this problem as well. Update: I just tried to install the bar snake and found that the previous owner welded big steel rods into the insides of the handlebar on both ends. I don't know how deep the bars go into the handlebars, but he did such a good job of welding, I don't think I could get them out without damaging the bars. I'll just go with squishier grips. I also have some gloves with gel in the palms, which make the ride more comfortable. I ended up putting the Bar Snake in my Honda XL500R handlebars, and it helped a little bit. Period road tests say the engine burns oil, and I found this to be true. One magazine drove one thousands of miles over a summer and found that it burned a quart every 1,800 miles. Not a big problem, but I make a point of checking the level every few weeks. Old Suzukis are famous for having regulator/rectifier failure. My GS1000 had a bad one, which I replaced with a JC Whitney generic part. It's probably still working now. I know you can find a good quality aftermarket regulator/rectifier made to fit an old Suzuki for around $100. People tell me Elextrex parts are good quality replacements.. My GS650G appears to still have the stock part, and it's still working fine. If you are looking for great information on old Suzukis, or if you are looking for a Suzuki GS650 for sale, take a look at www.thegsresources.com. They have a forum in which you can find an answer to any question you may have, and they have bikes for sale on the site, many of which were well taken care of by enthusiasts. Before you ask a question in the forum, do a search for the problem. In most cases the answer is already there.